This is a question we get asked, at Australian eBook Publisher, occasionally. Some authors will enter into self-publishing in order to have a finished and published book (print and/or ebook) to show to agents and publishers. 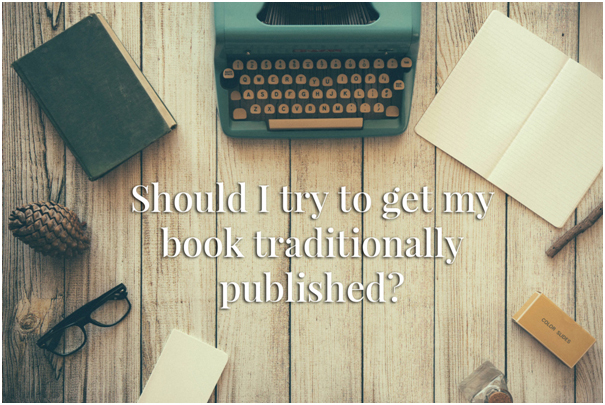 Whether or not an editor thinks a writer should try to get their book published traditionally depends on the writer, the book, the book’s genre, the publishers that deal with that genre, and many more considerations. For an individualised answer to this question please engage us for a manuscript assessment. What’s involved in getting a traditional publishing contract? If you do decide that it’s worth trying for traditional publishing, generally speaking,it is a good idea to look for an agent, rather than submit your manuscript to a publisher without; recommendation. This is not because it is easier to land an agent, but rather because books offered to publishers by an agent are more likely to be taken seriously than submissions from unknown authors. A literary agent represents multiple authors and their books with the aim to get them published. They receive a percentage of the author’s royalties for their work. An agent makes a publisher sit up and take notice. Each agent has their own reputation for the quality of their authors, which publishers are aware of. Publishers use agents to find the best manuscripts and authors to publish. In fact, most publishers will not accept unsolicited manuscripts (those submitted by an author without invitation and/or without an agent). Occasionally they do, but only on certain days or for certain imprints (you can usually find this information on the publisher’s website). Usually, publishers only work with reputable agents that specialise in the genre or style of their imprint. Landing an agent is said to be as difficult as landing a publisher, but if you do your research and follow their submission guidelines, and if you have a strong book with a very strong pitch, and months to dedicate to this, you might have a chance. The key is to ensure your book is what that agentis looking for. If you have a crime novel, don’t go to an agent who specialises in romance. If the only fantasy agent in Australia is not accepting any more submissions for the rest of the year, don’t bog them down with your enquiry. Wait until next year. Or go overseas. With traditional publishing you will only get 5% or so of the net receipts (royalties) compared with Australian eBook Publisher’s 85% or more. The most significant advantage of working with a traditional publisher is that you will not have to pay to publish your book. Any publishing situation where you have to pay, even if you are only expected to pay your own editor, is not traditional publishing. It is either vanity press, joint publishing or assisted self-publishing, so make sure you have a contract that is in accord with the publishing situation. With traditional publishing, you will not have to take on any financial risk; the publisher will. Most publishers will produce books in print and ebook, so if you don’t have the budget required, and the know-how, to print and distribute a printed book, this may be a significant advantage.Even saying this, many new imprints (off-shoots of the main publishing house) are being created that are digital-only. In traditional publishing, you might even get an advance. An advance is a payment received by an author prior to the book being published. It is an advance on the royalties you might earn. If the authors’ book(s) never earn enough royalties to outsell their advance, they will not receive any more royalty payments. Publishers do not usually offer an advance on a high-riskbook (one they are not surewill succeed) such as one by a new author. As the party taking the financial risk, a traditional publisher will edit your book as they see fit, design your book as they see fit, and market your book as they see fit. This is often considered to be a loss of creative control, and some authors dislike having to bow to the wishes of their publisher, experience low communication, lack of sales reports and few or greatly delayed royalty payments. In self-publishing you get the final say on, and take final responsibility for, the quality of each aspect of your book. In some ways this is an advantage, but in others a disadvantage. Two heads are better than one and many hands make light work. Publishing is a complex business, and some would argue it is a good idea to have experts making the important decisions. That is the beauty of assisted self-publishing. You get the benefit of experts to help you, but the freedom of creative control. Even in traditional publishing, you will still have to spend time and money building an author platform and marketing your book for it to succeed. A new author with a traditional publisher might not receive the same attention as a best-selling author at the same publisher. A new author’s book may only see a small amount of resources dedicated to their success, e.g. three months of being featured among a number of other books being promoted by the publisher’s marketing team. Publishing is a business, and success is impossible to predict. What sold well one year might not sell well the next. Though there are clear trends in what sells in terms of genre and target market, there is no guarantee as to what books will actually sell once they hit the market. If anyone truly had the advance knowledge to predict sales there would not be hundreds of books, courses, marketing training, and gurus all touting their knowledge of how to sell books and get rich. There is no magic key to selling books, only good strategies, research, hard work and a bit of good luck. With books, you combine the diverse and widespread interests of the book-buying public with arelatively low profit margin. It’s a numbers game—with most books, especially ebooks, the volume of sales is more significant than having a high unit price. Very few people get rich publishing books. A traditional publisher’s most significant income is earned by sales of their best sellers. Every book a traditional publishing house takes on is a risk. The less risky titles are those writtenby, or about, already established individuals with a successful brand. This is why it’s useful to work on a publishing proposal when submitting your manuscript, so you can point out why your book in particular will sell—a publishing proposal is often on a submission checklist for an agent or publisher. Not all require a proposal though, so be sure to check submission requirements first. If you’d rather not have to play the money game, or cannot convince a publisher or agent of your book’s worth, you might like to consider self-publishing. You can work out your cost-benefits analysis and profit margins and invest in marketing, or you can just get your book out there and see what happens. Self-publishers have this freedom. A traditional publisher does not. They must focus on the bottom line in order to stay in business. While a traditional publisher will take on the financial risk, accordingly one of the disadvantages to authors is being forced to wait around for the publisher’s schedule. If you decide to self-publish, you can see your book available in print and as an ebook in a matter of months. A traditionally published book, however, might take one to two years to be released. The distribution and reach of a traditional publishertends to have more impact than self-publishing. The bigger the publisher the more established relationships they will have with booksellers and wholesalers. Most publishers understand the book distribution chain in their country, and have contacts in the media. Their reach tends to be larger than a self-publisher’s reach, especially in the detail of how they can reach specific booksellers within their genre, in each country they publish books in. A self-publisher can release books globally on Amazon or other print-on-demand services, but will they sell? Traditional publishing has its perks, and for most people an offer by a traditional publisher should be seriously considered. For those who cannot gain traction in traditional publishing circles, or who want to maintain creative control and get larger financial pay-off, self-publishing is the better choice. Many authors who were once traditionally published are turning to self-publishing to gain control over how their book is edited, designed and published, as well as getting more closely involved in sales data and royalties. If you think you have a book that will sell well in a traditional publishing environment, by all means, follow that route. Australian eBook Publisher can help you with manuscript assessment and editing to assist you to have a strong submission. For all assisted self-publishing enquiries, please use our Quote Request Form. Amanda Greenslade is the director of Australian eBook Publisher and also serves customers as a publishing consultant, editor and a grass-roots book marketing strategist. She is a published author and you can read more about Amanda’s books on www.amandagreenslade.com.